Tesla entry-level Model 3 has 399 plus km range and hit 100 km/h in 5.6 seconds. Tesla has turned the automotive world on its ear with the Model S. Affirmation came from a source in Australia who had taken a Model S for a test run and came back stunned. But the price puts a Model S out of the reach of most enthusiasts. Tesla has now confirmed that a cheaper entry-level Tesla, called the Model 3 is being built. 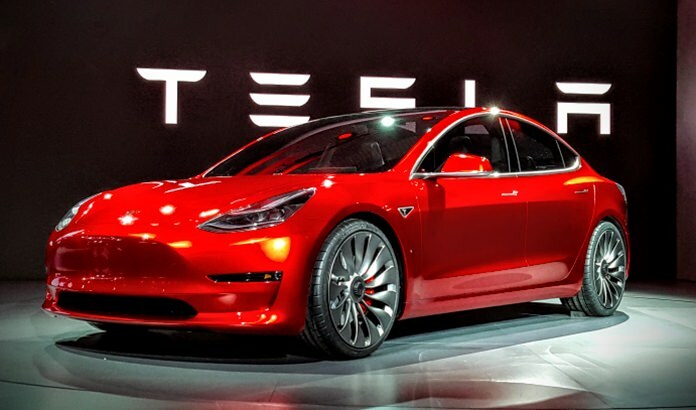 The Model 3 measures in at 4684 mm – 294 mm shorter than its big brother, the Model S.
The pure-electric rival to the BMW 3 Series will also take only 5.6 seconds to reach 100 km/h but the biggest news is the confirmation the from the Tesla website that the Model 3 has a range of more than 300 km – about 40 km less than Model S P75. Whilst the Model 3 is hardly the poor relation, the early information also reveals there will be significantly less choice when ordering the final specification of your car. While a Model S owner can have more than 1500 configurations at their fingertips there’s less than 100 possible ways to order your Model 3. Finally, while there’s less than 30 days’ wait for a Model S in the US, Tesla admits you’ll have to wait more than 12 months for your Model 3 to arrive if you order today. Tesla hasn’t released its list of ‘premium features’ for the Model 3 yet but they’re thought to include an advance air con filtration system, panoramic roof and larger wheels. After the Model 3, Tesla plans to release a Model Y SUV, an all-electric delivery van, a large people mover and even, potentially, a pick-up. Previous articleAnyone for a racing SUV?